Russian billionaire industrialist Andrey Melnichenko hit a setback in plans to sail his new €400 million “super yacht”, as it was impounded by the Gibraltar Port Authority. Gibraltar Admiralty Marshal Liam Yeats confirmed to euronews that yacht “A” was arrested on February 15, and released on February 21. “Sailing Yacht A”, whose three masts are each taller than the Big Ben clock tower in London, was on its way to be delivered, but port authorities took control of the vessel after its German builder claims Melnichenko still owes €15 million. The ship left its Kiel shipyard two weeks ago to conduct sea trials before being “arrested” by port authorities. The ship builder, Nobiskrug, is demanding Melnichenko pay an outstanding €9.8 million payment as well as an additional €5.5 million to subcontractors and interest payments. A spokesperson for Melnichenko told euronews the “unfortunate incident… is now resolved” and the vessel “will now be handed over to the owner’s project team and will leave Gibraltar shortly”. The spokesperson claims the pending payments were part of on-going contract discussions going back to Jan. 27, and that all outstanding monies were paid into an Escrow account the following day. 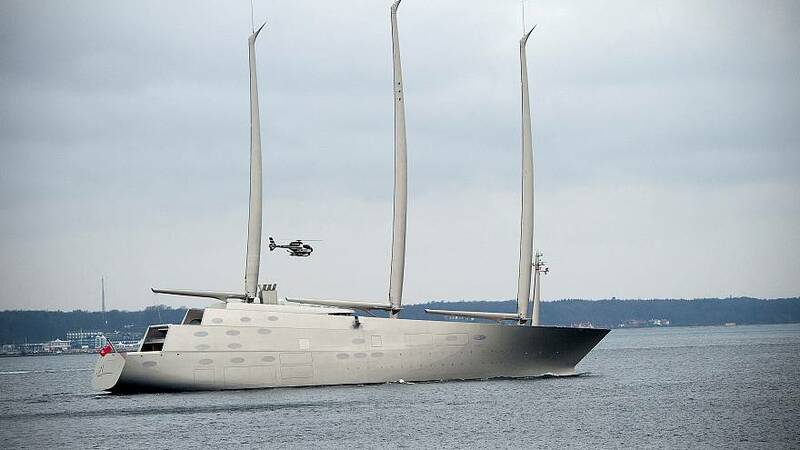 “We assumed the matter was progressing to a resolution as Nobiskrug were happy to release the yacht on February 5th to the Owner’s project team for further works to be carried out in Spain,” the spokesperson added. Gibraltar’s Port Authority website says ship arrests have increased in frequency over the years. Super Yacht A was designed by Philippe Starck. It boasts a swimming pool, underwater observation pod as well as a helipad. The yacht also has eight decks connected by lifts and requires 54 crew members to operate. It is the ninth-largest yacht in the world and was due for final delivery to Melnichenko by late spring 2017. Melnichenko’s spokesperson said they expect the Super Yacht A will be released in the next couple of days. The yacht is the second Starck designed for Melnichenko. In 2008, the Russian tycoon had bought Motor Yacht A, a 119 metre, €303 million super yacht whose design resembles that of a submarine. Melnichenko, however, reportedly put Motor Yacht A for sale last year. Melnichenko controls a €12.5 billion fertiliser and coal fortune. He is said to own a 737 jet plane as well as various properties from the French Riviera, to New York.